Pagination system has become an old and boring way to serve the products on eCommerce sites. Especially on the slow internet connection, you cannot rely on pagination and page loads to be quick enough. The Prestashop Infinite Scroll module is a modern replacement for page reloads and pagination system. Your customers need not move from one to another page to find their desired products in a category. They can seamlessly browse all your products on a single page with the help of Prestashop list view module. The products from the next page will be automatically loaded on the current page as they scroll down. Prestashop list product module is a perfect way to provide an easy and appealing user experience to your customers. It is certainly a wise addition to your conversion optimization plan. - Prestashop fast scroll plugin helps in increasing conversion rate of your store. - Prestashop quick scroll module makes the navigation to product catalog fast and easy. Prestashop quick scroll module Allows infinite scrolling on pages with product listing throughout the store. 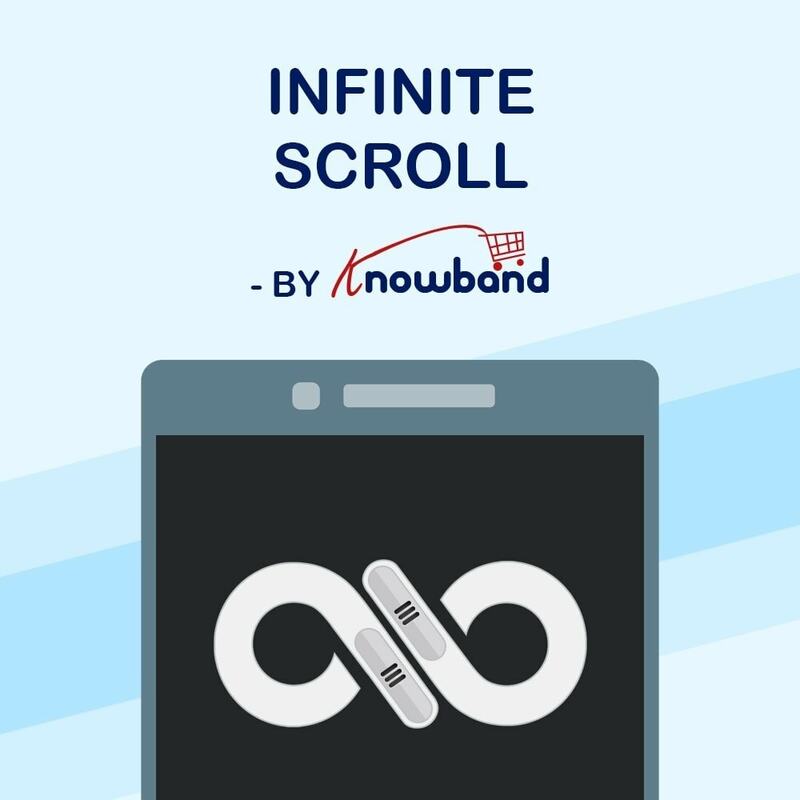 Along with advanced product and attribute filters, the Prestashop infinite scroll plugin makes it easier for the customers browse the catalog. The Prestashop infinite scrolling plugin offers advanced sorting of products on price, alphabet, or reference basis. 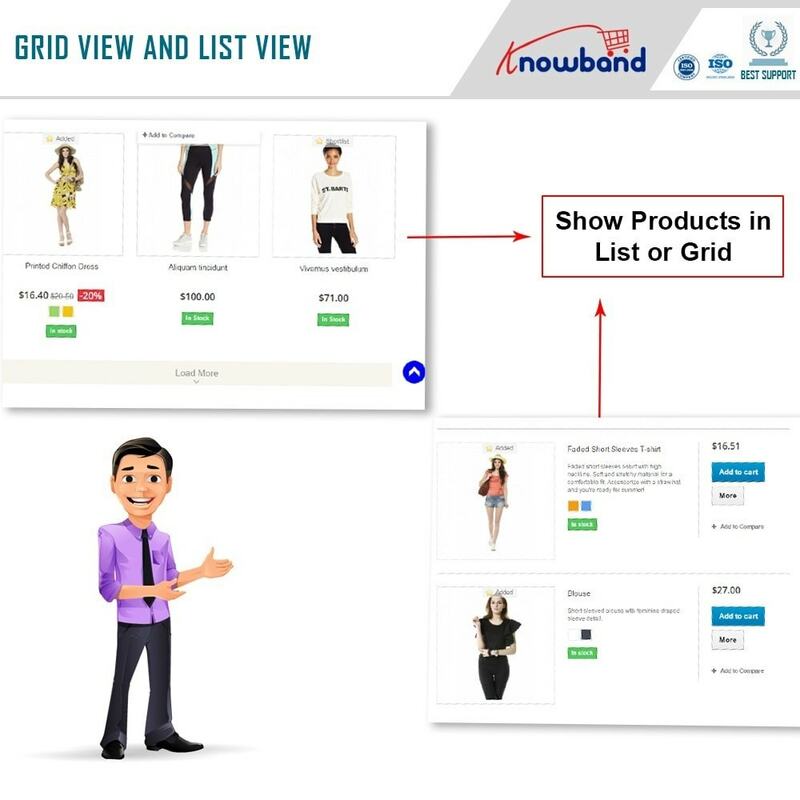 The Prestashop drop down scrolling module has the option for admin to choose from Grid or List view. 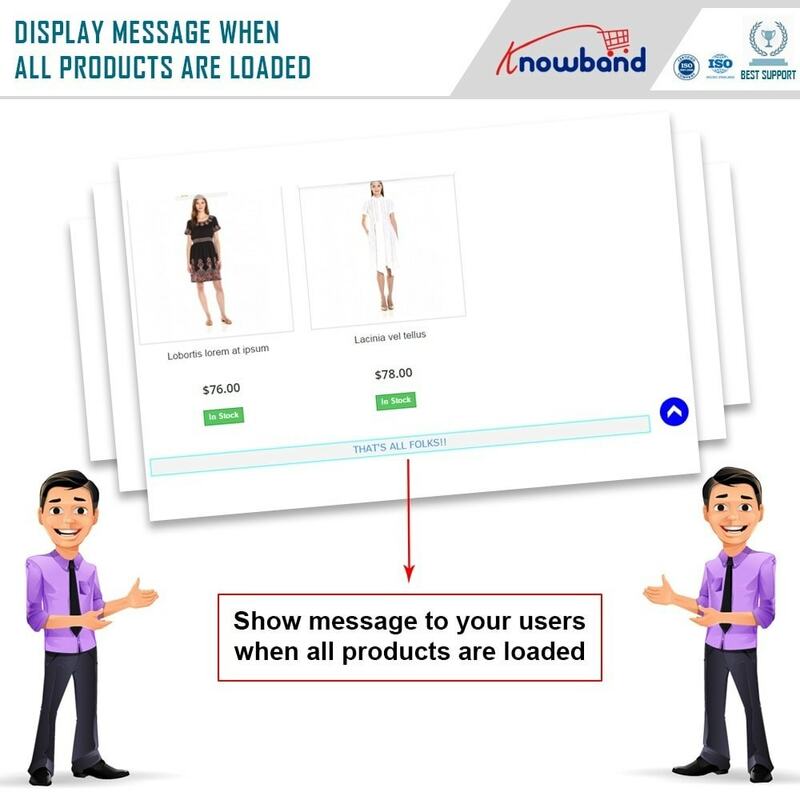 The Prestashop products auto loading extension is compatible with both types of product view. The Prestashop list view module navigates to the next page automatically without reloading the page. 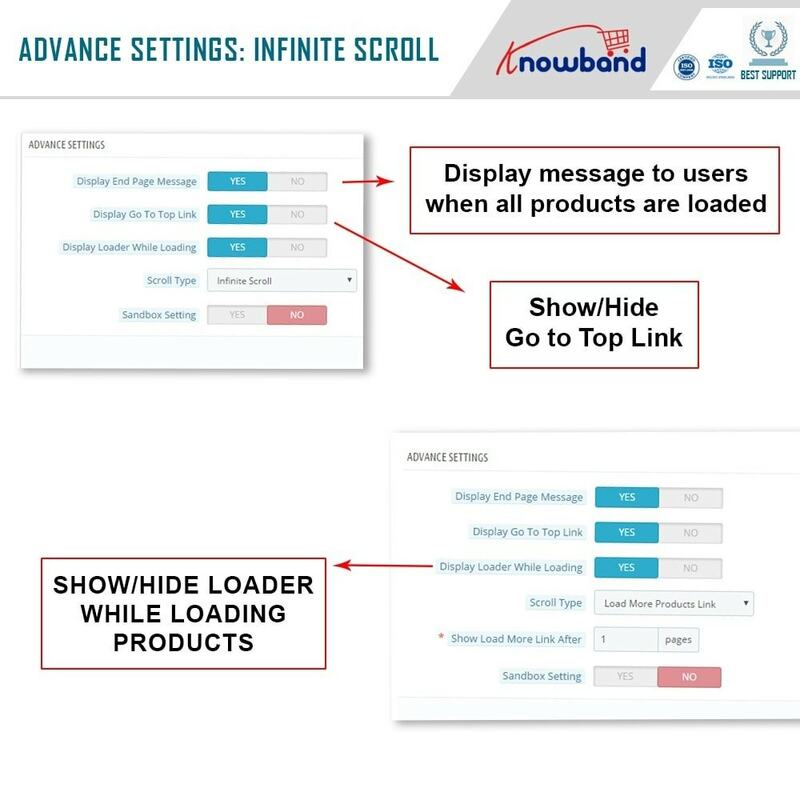 Admin can choose from Infinite scroll view or Manual loading view from the back-end of the Prestashop Infinite Scroll plugin. 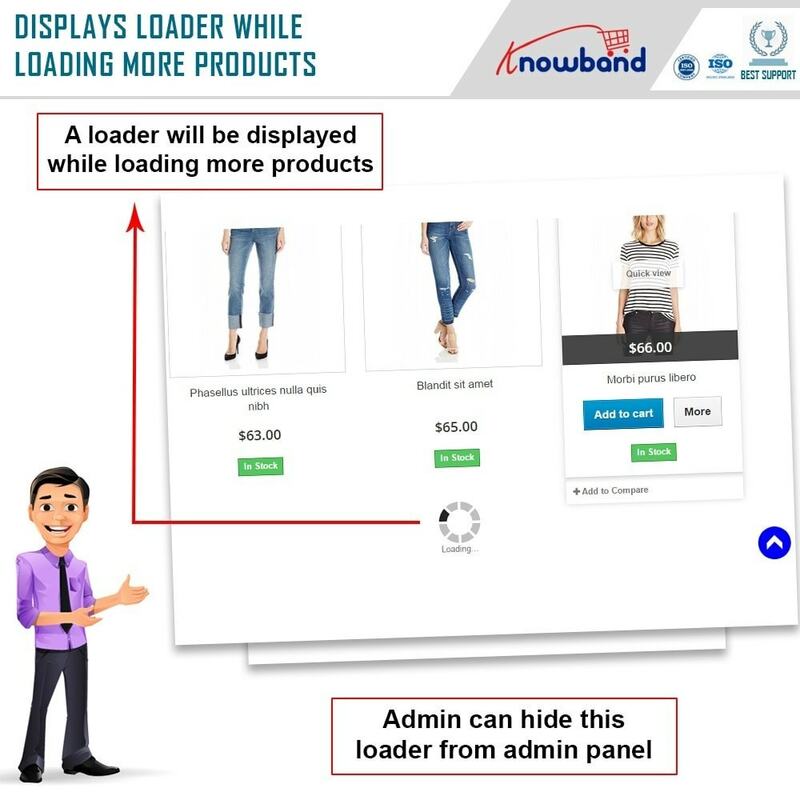 In manual loading view of the Prestashop list product module, admin can set the number of pages after which “Load more products” button will show up. 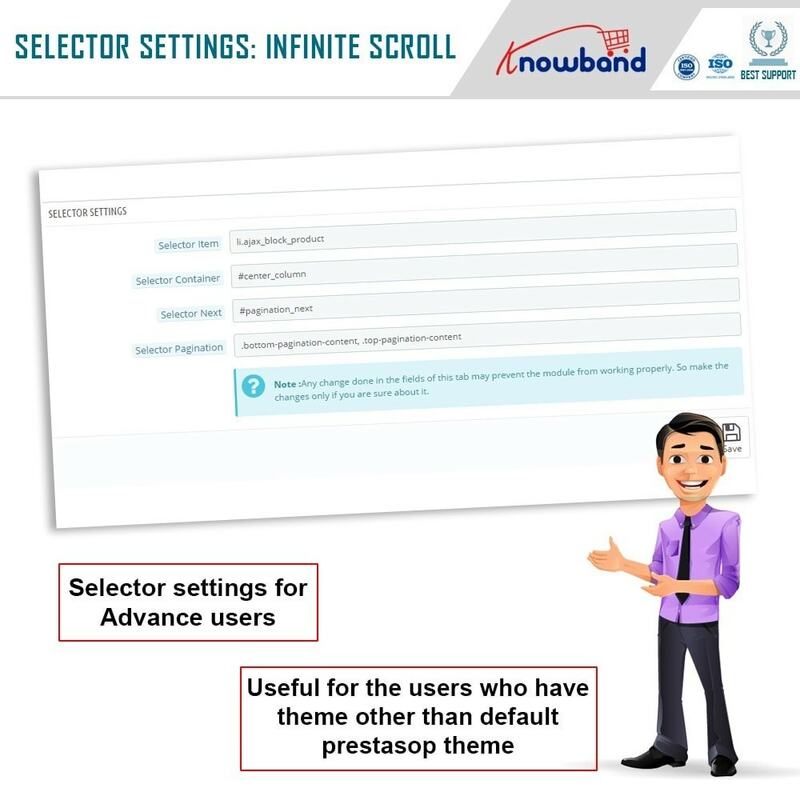 The Prestashop quick scroll plugin allows the admin to set default layout type as Grid or List view from the back-end of the Prestashop Infinite Scroll extension. The Prestashop fast scroll plugin offers the admin to set an End-page message to show when customers finish browsing all the products. 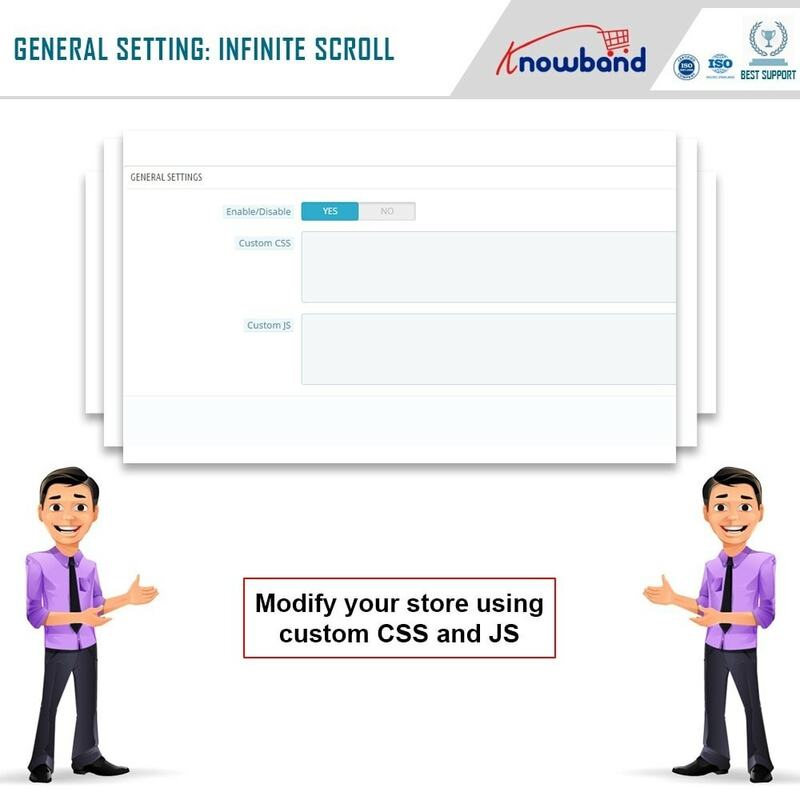 The Prestashop infinite scrolling plugin allows the admin to customize the look and feel of the End page message box. The Prestashop drop down scrolling module is compatible with SEO friendly URLs. 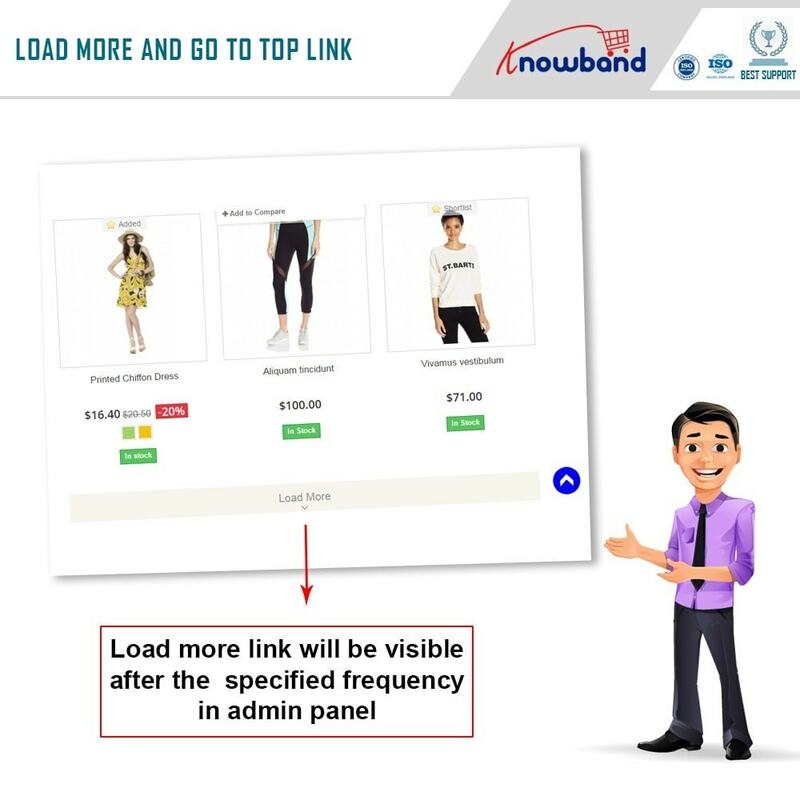 The Prestashop Infinite Scroll module offers the additional 'Go to Top' link to reach the top of any product listing page from anywhere on the page. Prestashop Fast Scroll plugin is SSL Compatible. Prestashop Quick Scroll plugin Works very well on your HTTPS-enabled store. They will love the easy and fast navigation on product listing pages. They will be impressed by better user experience, one-click navigation to any product page. They will enjoy the elimination of old and boring pagination system from product listing pages. 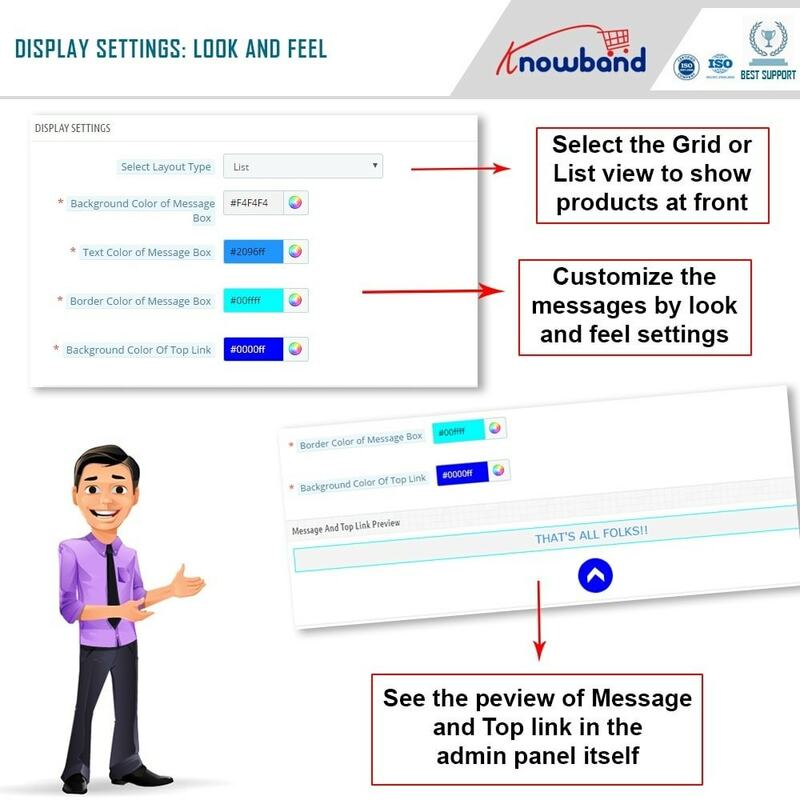 Option to choose between 'Grid' or 'List' view will help them personalize the view according to their convenience. 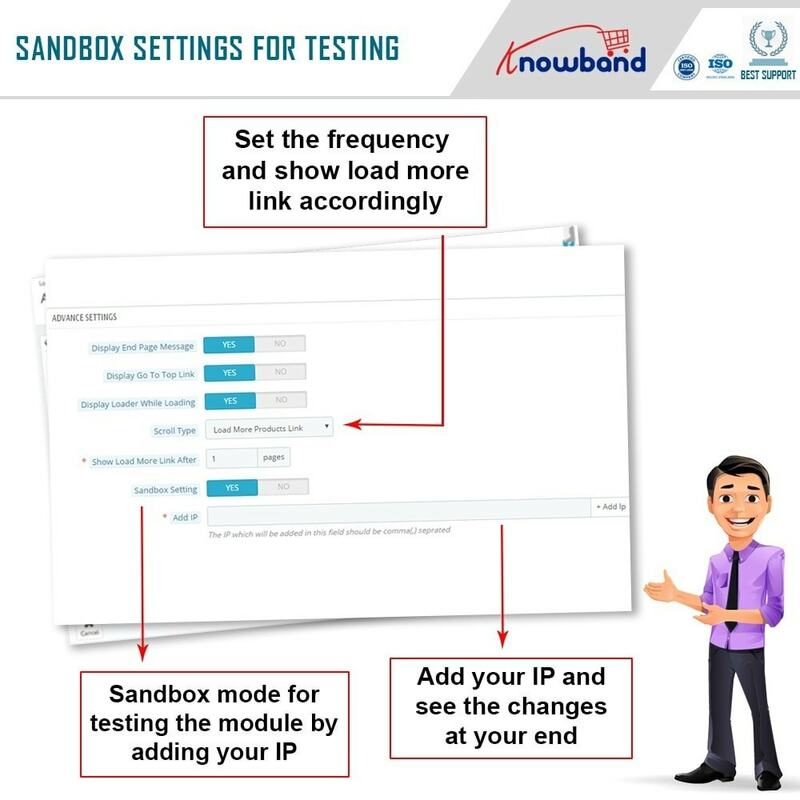 Advanced filtering of product attributes will help them to browse a more relevant list of products.